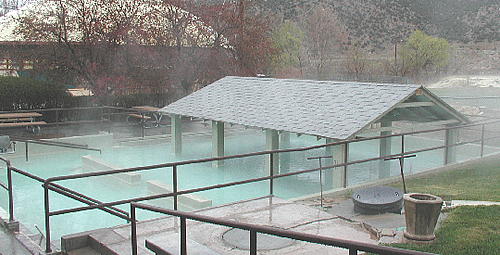 The State Bath House - In 1896, a treaty was signed with the Shoshone and Arapaho Native American Tribes, which gave the public free use of the mineral hot springs. 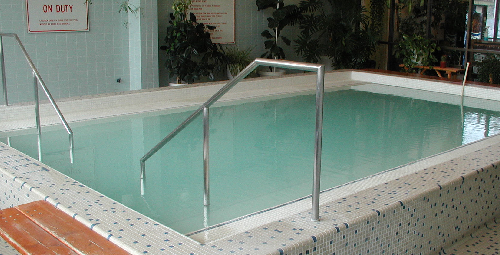 The hot mineral water is maintained at 104 degrees Fahrenheit to provide the safest healing water possible. Attendants are available to assist you with your needs. The Bath House hours are: Monday-Saturday, 8 a.m. to 5:30 p.m.; Sundays noon to 5:30 p.m. The Bath House is closed on holidays during the winter and open on holidays during the summer, noon to 5:30. 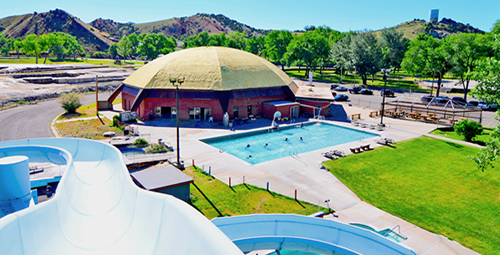 Hellie's Teepee Spa and Water Park has two large hot mineral pools (one inside and one outside), three hot tubs (both outside and inside) with water jets, a sauna and steam room. 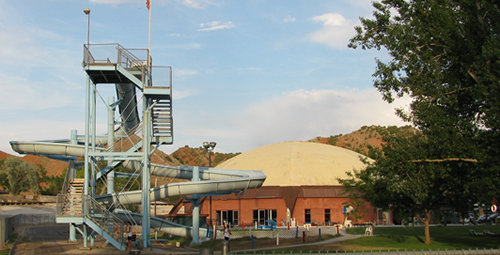 Helie's TeePee Spa and Water Park also has indoor and outdoor slides, water basketball and diving boards. Privately owned. 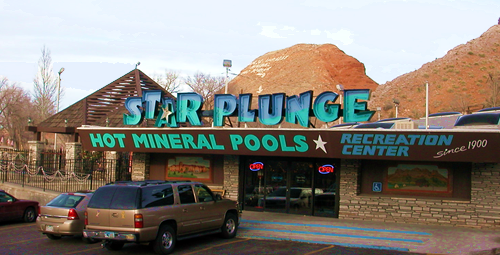 The Star Plunge Water Park has hot mineral pools indoor and outdoor, hot tubs (both inside and out), three whirlpools and a vapor cave. Enjoy water slides both inside and out. Also available, are a weight room and tanning. Privately owned. 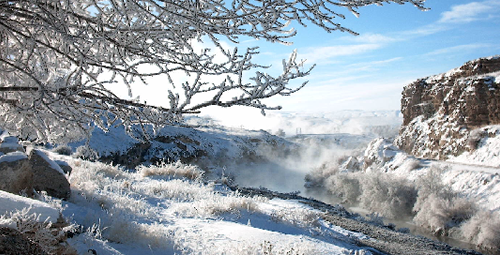 Enjoy a walk through the beautiful mineral terraces formed by the Worlds Largest Mineral Hot Spring. Fish the Big Horn River, a Blue Ribbon River, that flows through the Hot Springs State Park (Handicapped accessible piers and boat ramp). 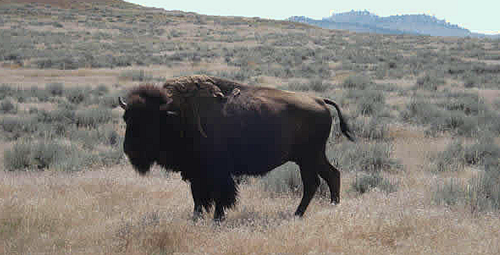 Take a ride through the Buffalo Pasture and see a wild herd of Buffalo. 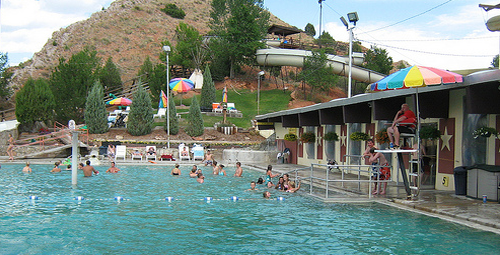 Enjoy the relaxing atmosphere of the Hot Springs State Park complete with three picnic shelters, charcoal and gas grills, volleyball nets, horseshoe pits, fishing piers, playgrounds and more. 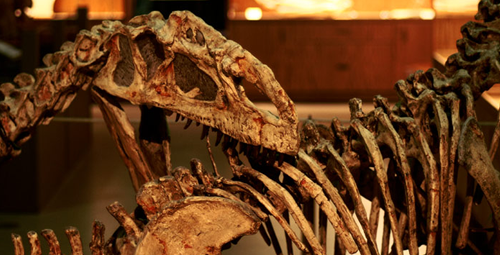 For wildlife lovers, photographers, and explorers; there is a world to discover in Thermopolis. Take the Wind River Canyon Scenic Byway between the ancient rock cliffs of Wind River Canyon--the same path once used by Native Americans, explorers, and pioneers. Continue through the Wind River Indian Reservation, keeping an eye out for bighorn sheep. This route is a geologist dream! Deer, antelope, fox, coyote, badger, and other wildlife are everywhere to be seen. Buffalo as well are familiar residents. 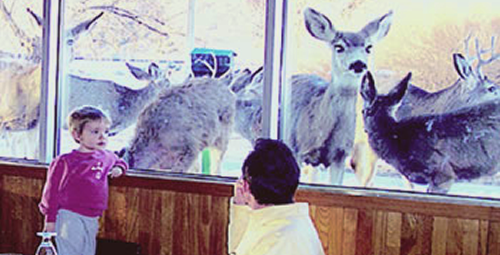 At dusk guests of the Thermopolis Days Inn gather around our large picture windows in the Safari Club to view the local deer herd. Bison roam within the 10 acres of Hot Springs State Park. See them grazing in the pasture near Monument Hill. A herd of Wild Burros and deer can also be seen. A great family adventure! 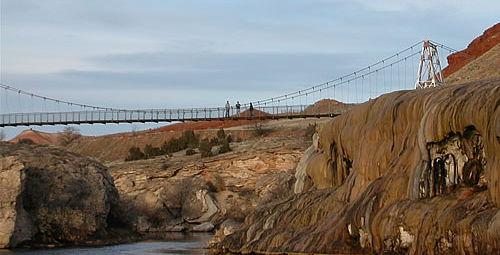 The unique swinging bridge located in Hot Springs State Park has been restored in recent years and visitors can walk above the Big Horn River to enjoy a "bird's eye" view of the Big Horn River and Hot Springs State Park. Wind River Canyon Whitewater and Fly Fishing is the exclusivexclusive whitewater rafting and fly fishing outfitter on Wyoming's Wind River as it winds from the Wind River Indian Reservation border just east of Dubois, Wyoming for over 100 miles before completing its amazing journey with a 15 mile plunge down the spectacular Wind River Canyon just outside Thermopolis, WY. Legendary among the locals, but little known outside Wyoming, the Wind River is quickly gaining a reputation for its beauty, seclusion and vastness among its lucky visitors and only Wind River Canyon Whitewater and Fly Fishing can take you there. 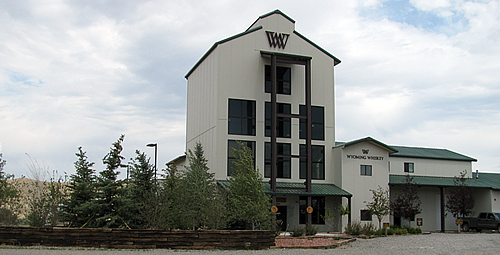 Visit Wyoming Whiskey and learn how hand-crafted bourbon is made with the use of premium Wyoming ingredients. See the process of milling of locally grown corn, wheat, and malted barley, and how they are cooked. Learn about the fermentation process which utilizes a specially selected yeast. Take a tour through the distillation process which utilizes a one-of-a-kind, 38 foot copper still, which was designed and built especially for Wyoming Whiskey. Wind River Casino boasts over 750 Gaming Machines including Videos, Video Poker, Reels and Progressive Jackpots. Easy to use ticket-in- ticket-out systems, change kiosks and ATM machines are available.